How to Plan, Estimate Costs and Hire the right Home Improvement Contractor so you save Time and Money, and prevent Hassles! Want to build a new custom home but don’t know where to begin or what general contractor to hire? Would you like to develop your own new home construction plan and building cost estimates to compare with contractor bid sheets? Do you know what questions to ask to ensure you’re hiring the right general contractor for your new custom home? Avoid a home construction project disaster! 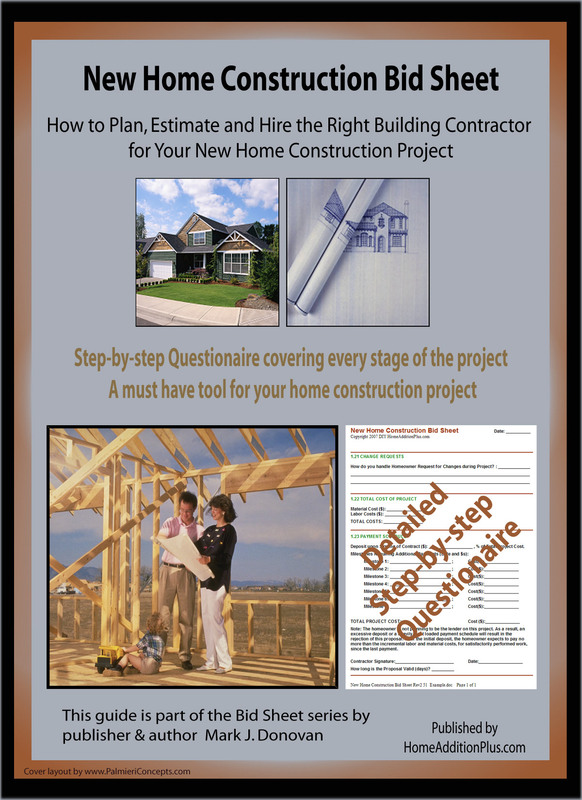 My New Home Construction Bid Sheet provides you with the knowledge on how to plan a new home construction project, and what to look for when hiring contractors for your new home. A free and and editable Cost breakdown Excel Spreadsheet is also included for estimating your own new home construction costs. My New Home Construction Bid Sheet Includes! Separate and Editable Cost breakdown Spreadsheet for estimating your own new home construction costs. Extensive new home construction guidance, to ensure you get your new home construction plans completed properly and on time and budget. Free Customer Support – Same day response to any questions you may still have after reading this bid sheet. Order Now and Immediately Download the New Home Construction Bid Sheet today. The New Home Construction Bid Sheet costs only $19 and is 100% guaranteed. The 30 page New Home Construction Bid Sheet includes! A request for proposal (RFP) form that you submit to the prospective general contractor(s) for them to complete and provide back to you for review. 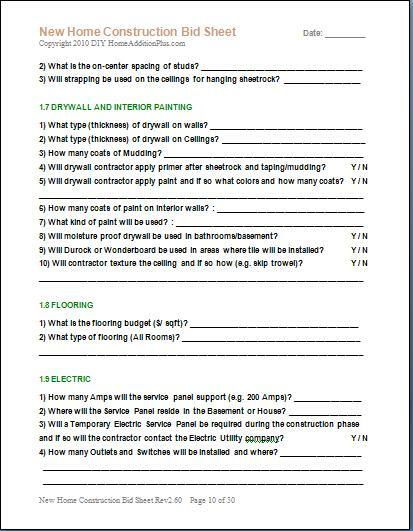 RFP form contains over 170 questions on all aspects of your new home construction project. ensure a successful new home construction project. I purchased the New Home Construction Bid sheet download today. We are very satisfied with it and will find the information contained in the document very helpful. Over the past 30+ years I have been involved with countless home construction projects. As a teenager I helped my father build several homes and various home additions. After obtaining a Bachelor of Science degree in Electrical Engineering, I purchased an unfinished home. I used my previous home construction experience to frame, insulate, wire, and plumb the unfinished portions of the home. I repeated this process a couple of years later on another home. In subsequent years, and with much of my own personal sweat equity, I continued to do other home construction projects, including room additions and garage additions. In 2000 I tackled tearing down an existing home and building a new one in its place. I wrote about my experiences with this project, and in 2005 the DIY Network (a premium cable television network) filmed a show featuring this project. The show was part of a series and was titled “Be Your Own General Contractor – Vacation Homes”.